encourages user interface designers to begin thinking of how to design for wide-screen mobile displays, as that is the direction that mobiles are headed. Looking a bit further into the future, the iPhone may not be the only phone on the market but everyone agreed when it was released that it raised the bar for a mobile web experience. What is pretty clear is the trend towards widescreen and landscape orientation for high-end phones. QVGA and larger phones are getting automatic screen rotation. 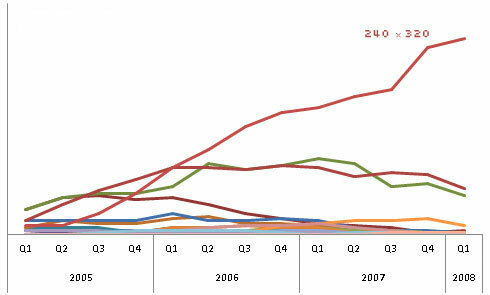 Landscape is often preferred for media consumption and handheld movie consumption has been “promising” for quite some time. 240 x 320 (aka QVGA) is the new baseline screen size, both for feature phones and smartphones. 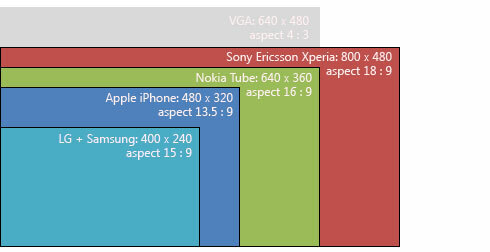 Future mobile devices will eventually be able to display more pixels than the 640 x 480 pixels of that stalwart of CRT monitors, the VGA display — the forthcoming Sony Ericsson Xperia will have screen dimension of 800 x 480! The usual disclaimer of “test your own user data” applies, as patterns in Norway are not directly applicable to the rest of the world. But interesting stuff nonetheless! PS. If you’re not sure where to start with mobile web design, check out Brian Suda’s recent article here on SitePoint: Designing for the Mobile Web.